Normal day-to-day operations are enough to keep any $12 billion global company busy, but VF Corp. has taken on some extra initiatives that might make for some late nights but will also create new shareholder value and transform the company in the process. Among its more time-consuming activities, VF is moving its corporate headquarters to Denver, CO, spearheading ambitious growth plans up and down its outdoor and action sports portfolio—including a huge target for its Vans brand—and fine-tuning a new “purpose” the company laid out in July. Soon after VF reported second quarter earnings on October 19, CEO Steve Rendle and CFO Scott Roe spoke with SGB at length about these items and more taking place at the (for now) Greensboro, NC-based company. Rendle and Roe dished on the forthcoming move to Denver, VF’s commitment to becoming a purpose-led company, Vans’ five-year journey to $5 billion in annual revenue, growth drivers at The North Face and upside at two smaller outdoor brands—Icebreaker and Smartwool. The plan for VF Corp. to relocate its global headquarters to Denver is on track, Rendle and Roe told SGB. Up to 800 employees will move to Colorado, including workers from the corporate office and from VF brands The North Face, Smartwool, JanSport, Eagle Creek and Altra. VF last month announced it had signed a 12-year lease at 1551 Wewatta Street in Lower Downtown, where the company will occupy the entire 10-story, 285,000-square-foot building. Executives are still deciding on the signage that will adorn the building’s exterior—either VF Corp., one or more of the brands, or a combination of parent company and subsidiaries. The company has been hosting “market immersion” trips for employees to visit Denver and learn about the area, and VF will begin moving in during the summer months, with the headquarters expected to be up and running by next fall. Rendle said the company used its Stabio, Switzerland, office as a blueprint for the Denver location. The goal of “co-locating” brands in one location is to create an environment that fosters leadership and talent development, while also uniting multiple brands in the same workspace. This “gives our employees opportunities to experience multiple brands and move into new roles,” Rendle said. VF’s move to Denver is also another win for the city and the state of Colorado, which recently secured three Outdoor Retailer shows for at least five years, giving this community the “unofficial home of the outdoor industry” status—at least in some people’s eyes. SGB asked if VF’s move bolsters that claim and will help fuel the entire Colorado outdoor industry. At Outdoor Retailer Summer Market in July, Rendle gave the keynote address at the Camber Outdoors breakfast and explained this vision in detail. And in his recent comments to SGB, he listed how being purpose-led is exemplified in each of VF’s business divisions. For VF’s outdoor segment, the company is committed to the environment, including access, inclusion and diversity. VF’s action sports business is about promoting creative self-expression, celebrating individual diversity and respecting every individual for who they are and what they stand for. And in the work segment, VF celebrates “the dignity and the importance of construction and trades to power our economy,” Rendle said. SGB asked how the company balances meeting those diversity and inclusion goals while also hitting financial targets, and if they go hand in hand with each one elevating the other. VF’s best-performing brand of late has been Vans, which in September announced an ambitious plan to reach $5 billion in annual revenue by 2023 through a series of growth drivers that the company expects to generate compounded annual growth rate (CAGR) of 10 percent to 12 percent each year over the next five years. Part of the strategy, Roe told SGB, is reframing the way the brand is perceived in the marketplace, which appears to have already gained traction, as the brand notched 26 percent revenue growth in Q2. “It’s no longer about being the largest skate/surf brand, which it is, but it’s about Vans being an everyday choice in that athletic leisure lifestyle along with brands like Nike, Adidas, etc.,” Roe said. “When you think about it that way, we’re really just getting started. You see that on the street with how many people are choosing this as part of their closets. You see it in retail shops, where instead of on the back wall, it’s in the drive aisle and in the window. There’s more and more and more placement that puts Vans on an equal footing with some of these much, much larger franchises. Rendle and Roe added that the confidence VF has in Vans should translate across the VF portfolio—a rising tide that will lift all brands. Vans has taken a lot of the spotlight in VF’s portfolio, but The North Face has also flourished. In Q2, The North Face’s revenues rose 5 percent, or 7 percent on a currency-neutral basis. The gains were led by DTC and digital across regions. With continued oversized growth for The North Face in the EMEA region and some improvement in the Americas in the second quarter due to strengthening demand for lifestyle apparel offerings, VF raised guidance to 7 percent to 8 percent, up from 6 percent to 8 percent, which was also the five-year target, Rendle said. VF doesn’t always break out the numbers for two of its smaller outdoor brands—Icebreaker and Smartwool—so SGB wanted to dig a little deeper into the performance of those companies. 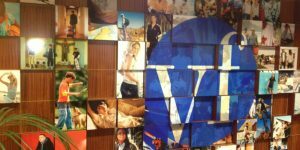 VF announced the acquisition of Icebreaker last November and closed on the deal in April. The company said it’s pleased with the portfolio’s newest asset and has high aspirations for the brand. As for Smartwool, the popular brand not only is moving to Denver from Steamboat Springs, CO, but has a new president, Jennifer McLaren, who was appointed in June.